Yesterday I woke up terribly late, even for a habitually nocturnal person. I had promised an outfit post so I wasn't going to let myself or you guys down! I ran outside with my equipment and tried shooting in the sunlight while avoiding nasty shadows. The usual shady spot in front of my garage is too dark at around 6 PM so I tried many different places along my street for lighting. This explains all the different backdrops. I wanted to do a cute Western look inspired by all the kawaii models in Popteen magazine earlier this summer. 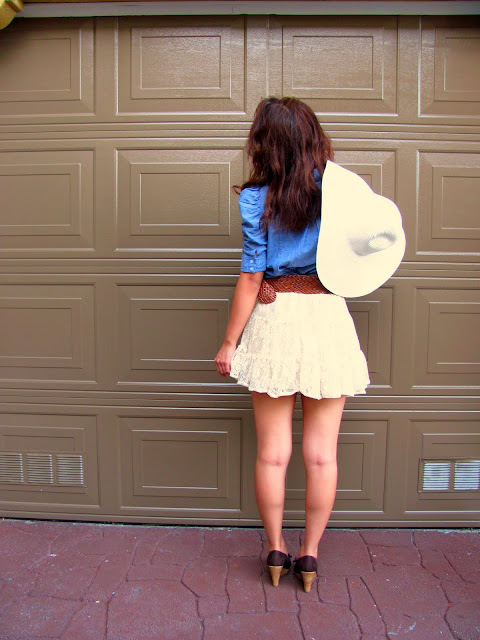 Chambray/denim shirt, white skirt with brown belt, cowboy boots, curly hair, cowboy hat. Unfortunately I had only half of the materials so I decided to revamp the look into more of an "urban cowgirl" outfit. Instead of ankle cowboy boots, I had brown peeptoe wedges (that fit like true 5's) from my outlet mall Payless stop. No cowboy hat but I recycled my big white floppy sunhat from my sailor dress outfit. The chambray-ish shirt I purchased at Forever 21 this weekend for $17.80 (is it just me or are they getting SO much more expensive!?) and the skirt at rue21 in the outlet mall for $21.99. The sales associate helped me grab this last Medium off the top hook after giving me a look that said "Girl, how you gonna wear a Medium..." Fortunately this belt is very, very adjustable and I tightened it a lot for the perfect fit : ) Since I didn't try out this chambray-ish shirt inside the store, I felt a little uneasy. I think it could work for casual wear because it's super long and has a tie attached that I can bring around to the front. I would wear this top with chunky accessories and black leggings or skinny jeans. Remix, remix! I like the ruched shoulder detail because it makes such a masculine style more feminine and gives my frame a little more "oomph" to balance things out. The only thing I'm missing is a giant red beat-up pickup truck. I'm trying to break this bad habit of fashioning an outfit in my head and then going to buy pieces - I feel like my life has become a daily dose of costume party haha. For makeup I curled bits of my hair and tried to curl others pieces with my straightener but both failed. I spritzed in some 4-year-old Garnier Fructis shake effect gel (gross, I know) and scrunched my ends and flipped my hair around like a rockstar until I got a nice volumized crazy curl going on. I was sweating so much I'm pretty sure half my foundation melted. A bronze eyeshadow and bronzer instead of blush created a kind of dirty look that I liked. It feels like I just went out and drove a tractor or chased some tumbleweed. It's so funny because even when I lived in Oklahoma for 5 years, I never embraced the suburban cowgirl look. In my town, most of the kids were very prep but broke out the cowboy boots and oftentimes owned family ranches. I love these wedges! They're quite small for 5's so it's perfect for my narrow and teeny tiny feet. I might have to break them in with some baggy socks - I spy a future outfit coming up! They were originally $25 at Payless but since they had a BOGOHO deal, I got these babies for $12.50! They're really easy to walk in so I can strut in style without looking crazy in class. Love! After sweating off half my makeup during the shoot xD This is my natural lip colour - absolutely nothing on them right now. Crazy pale, right? angie....i wanna call you panda sometimes...heehee bc of your love for pandas. 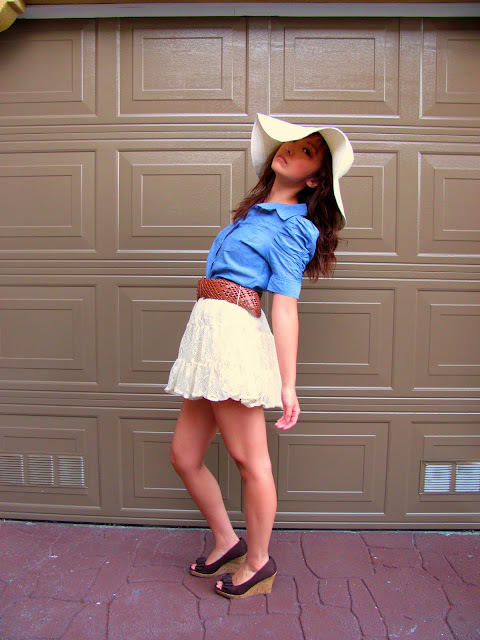 i'm in love with this outfit...from the hat, to the belt & they shoes (great accessories!). your pics are fun to look at as always. Angie, you do the cutest themed looks! :D I love the Southern Belle idea... I MIGHT copy you and wear it to work tomm! I have a similar white skirt that I NEVER knew what to wear it with. You are so cute you don't need to constantly buy makeup! hehe :) Your accessories are by far the coolest thing. Love your theme and good luck with the makeup ban. I don't have enough makeup for a ban...but clothes definitely! gorgeous hat! and the nudy lens looks great on you! I am loving your outfit, Angie :) Very cute and girl. You always have so much fun taking blog pictures. Those contact lenses are adorable. Does ELF accept money order? If they do, you can mail in the money order. It's safer that way. Have a fabulous day! That hat is SOOO cute! I love your pictures as always, you always look like you have so much fun taking these pictures. Gorgeous! Cute! Pretty! LOVE LOVE LOVE!! Everything! I love this outfit (like I don't say that all the time??) hehe, I absolutely love the hat! Its so pretty and lady like! Is it even safe to put money in an envelope?! Haha pretty much ditto to what everyone else said! Very cute I like it! I'm with you on the makeup.. I own a small amount, but I only use one ELF palette and liner daily. 99% goes unused! LOL.. vampire..too funny..Love this look!! That shirt pairs so well with that skirt, and your hat- oooohhh that wide brim has me smitten! Lovely outfit and I love your header, of course. The most blogger just post some pictures but you are also a good writer! Gah I always love your outfits and your photos make me smile you always look like you have fun!! N-n-n-no make up till 2011 D: HOW WILL YOU SURVIVE. And I have never tried ELF stuff xD I wonder if its any good!! My lips are kinda pale in colour too thats why I like tinted lipbalms! Haha but believe me, none of the hicks here in Iowa dress half that awesome lol. Awe....what a pretty southern belle you are!! I love love this outfit on you! It may be one of my favs so far!!!! Are you taking pics now with your tripod?? :) They look great! nice post love your look. yes those are my legs! beautiful photos!! 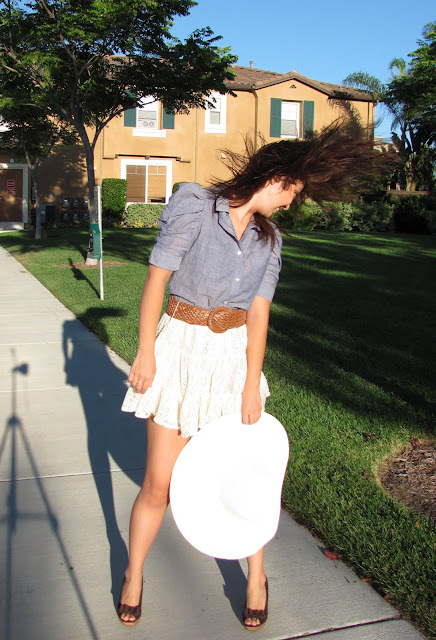 your outfit is so adorable <3 i adore your lace skirt and hat!! and your hair is amazing-i love it!!! I'm loving the floppy hat and the denim shirt! Also, I'm really happy you are doing a st. ives mreview because I love their exfoliater wash and it is super affordable! Thank you!! I love girly lacy things at the moment, they are just totally me, I think I finally found a style I will settle into that suits me!! And I was a bit weary of doing my nails like this but I just thought if I don't like it I can take it off and just dived right in there haha!! I love being a little bit creative with my nails! Well I might try some ELF stuff at some point when I have the money xD And thats true, your purse will be happier! Spending money is indeed like a disease T_T I look on shops and think I want that but my purse can't take it!! Lovely outfit. I'm in love with that lace skirt! You pull the hat off so well. Such a feminine girly look that's perfect for the weather. I love your skirt and your make up looks great! Very stylish outfit. Nice pictures.